Tanganyika cichlids are popular among aquarists and cichlids from Lake Tanganyika can be obtained in a large range of varieties, sizes and colours. Lake Tanganyika is the second deepest lake on the planet and is located in central Africa. It is one of the oldest lakes in the world, and the comparatively strict isolation from other waters has caused an abundance of endemic species to form throughout the lake's long history. The cichlids have adapted to fit the diverse environments found in the lake and the difference between different Tanganyika cichlids can be quite astonishing. There are more than 150 different Tanganyika cichlid species known to science and there are probably even more species left to be discovered. Lake Tanganyika is still rather unexplored by science even though it’s a popular lake for fishermen and aquarists alike. 98 percent of the described Tanganyika cichlids are endemic to Lake Tanganyika and can be found nowhere else in the world. In this article you will find some general guidelines to consider when keeping Tanganyika cichlids, but remember that they are a diverse group that inhabits many different environments, and that a particular Tanganyika cichlid species therefore can have its very own requirements. It is always advisable to do some research regarding the specific species or cichlids group that you want to keep. Since all Tanganyika cichlids live in the same lake, they will however share the same requirements when it comes to water chemistry, temperatures and similar factors. The Tanganyika cichlid species have very different maximum sizes. A majority of the most commonly kept species will however stay within the 2" - 14" (5 cm - 35.5 cm) range. A 32" (80 cm) or 30 gallon (114 L) aquarium will therefore be large enough for a community aquarium with small or medium sized cichlids. If you want to keep fish from different biotopes in the same aquarium you will usually need more space than when you keep very similar cichlids. Tanganyika cichlids from several species are often combined in community aquariums. Make sure that the fish are of roughly the same size. If you want to keep Tanganyika cichlids from several biotopes you will need a larger aquarium. Make sure the aquarium setup include suitable areas for all cichlid types. Rock dwellers must be provided with caves, sand dwellers with sand and snail shells etcetera. Tanganyika cichlids can also be combined with a lot of other fishes, including many types of cichlids. Choose robust fish of roughly the same size, and make sure that they have similar needs when it comes to water temperatures, water chemistry etcetera. Cichlids from another large African lake, Lake Malawi, are often successfully kept with Tanganyika cichlids. 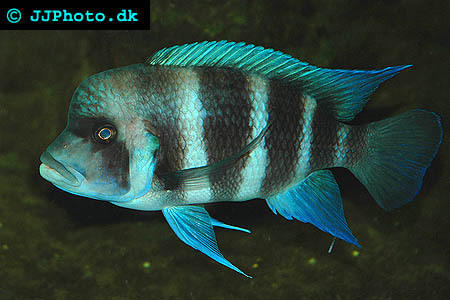 Mbuna cichlids from Lake Malawi are however too aggressive and competitive when it comes to food, and is therefore not suitable companions for Tanganyika cichlids. 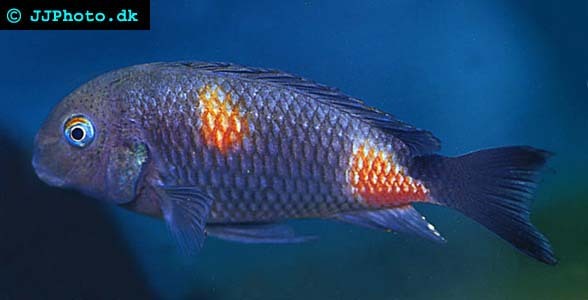 Less aggressive Malawi cichlids, such as those from the genus Aulonocara, are much more appropriate. Tanganyika cichlids are also known to do well together with Catfish, Rainbowfish from Australia and New Guinea, Tanganyika Killifish and Tanganyika Spiny Eels. Tanganyika cichlids can express a lot of aggression towards each other as well as towards other species. There is however several ways of reducing the amount of fighting and make the more submissive fishes feel less stressed in the aquarium. Always keep your Tanganyika aquarium well filled with plenty of fish. If you keep a lot of fishes, attacks from a dominant bully will be dispersed over many individuals and each fish will experience a lower amount of stress and injuries. Fights will typically be more frequent and violent in an aquarium that houses just a few cichlids. Another important thing to remember when you keep Tanganyika cichlids is to provide each fish with several hiding places. The most dominant fishes will probably claim the “best” spaces, and it is therefore important that you create several places in the aquarium for each fish. Tropheus sp black bulu point - a mouthbrooding cichlid from lake Tanganyika. When you arrange the set up for the aquarium, it is always a good idea to make it similar to the natural environment for your cichlid species. A lot of commonly kept Tanganyika cichlids are rock dwellers that inhabit the rocky shores of Lake Tanganyika, but there are also many sand living species. If your cichlids are rock dwellers they will appreciate a rocky set up with plenty of hiding places in the form of caves, crevices, overhangs, tunnels etcetera. You can use coral sand as bottom substrate to buffer the pH. Caves are imperative if you want to the rock dwellers to spawn. A larger cave can also be a good way of reducing the amount of stress experienced by the submissive fishes. If you build a nice cave, the most dominant Tanganyika cichlid will almost certainly claim it. As long as the dominant cichlid stays around his favourite spot, the other cichlids will be able to feel more relaxed in the rest of the aquarium. It is also important that you create a lot of hiding placed for the submissive cichlids in the aquarium. If you create natural borders that divide the aquarium into several regions it will be easier for each individual cichlid to claim its own territory, and this will reduce the amount of fighting among them. If you are keeping sand dwelling cichlid species it is important that the bottom of the aquarium is covered in sand. If you want to use corals to buffer the pH, you can buy coral sand. Just like the rock dwelling cichlids, the sand dwellers will do much better when provided with plenty of hiding spaces in the aquarium. Sand dwelling cichlids like to hide in and among snail shells that are placed on the substrate. Shells are also used as breeding sites. Regardless of whether you keep rock dwellers or sand dwellers, your cichlids will need a large area of open water to swim around in. Cyphotilapia frontosa is another lake Tanganyika cichlid. It is very important that you keep the water chemistry at suitable levels and perform regular water changes. Tanganyika cichlids are very sensitive, and are for instance much more vulnerable than Malawi cichlids. If you allow toxic compounds to build up in the water your Tanganyika cichlids will soon show signs of illness or simply die. Massive water changes are not advisable for a Tanganyika aquarium since this might harm the cichlids. Small water changes that are performed very often are ideal. Lake Tanganyika has very little current and it is therefore not recommended to use an aquarium filter that creates a strong current. In Lake Tanganyika, the cichlids experience pH levels between 7.8 and 8.8. When kept in aquariums, most Tanganyika species will tolerate a pH value between 7.5 and 9.0. The same thing is true for the dH-value. In Lake Tanganyika, the water is always medium hard with a dH between 7 and 11, but in captivity most Tanganyika cichlids will tolerate up to 18 dH. A majority of the Tanganyika cichlids inhabit regions of Lake Tanganyika where the temperature stay between 75 and 84°F (24 and 29°C), and this temperature range is therefore ideal in the aquarium. Cyprichromis leptosoma is a surface dwelling lake Tanganyika cichlid. When it comes to feeding, some Tanganyika cichlid species are highly specialized, e.g. the cichlids that feed by eating from scales and fins of other fishes. Others are more opportunistic and can be trained into several types of food in the aquarium. It is always important that you find out what kind of Tanganyika cichlid you are keeping and which ecological niche it inhabits in the wild. Most Tanganyika cichlid species prefer live foods and will do well on a diet of insect larvae, crustaceans, aquatic insects and similar. There are also a lot of algae eating Tanganyika cichlids, and they will of course like algae and can be trained onto prepared foods based on vegetables or algae. It is usually easy to make both types of Tanganyika cichlids accept flakes, tablets, pellets and other dry prepared foods. You should always give your Tanganyika cichlids a varied and well balanced diet to make sure they receive all necessary nutrients. Tanganyika cichlids will often survive on a monotonous diet, but they will not thrive and they will be more susceptible to illness.